from someone who doesn't understand. not in rows but in broken places. That said, I find that forgiveness is the key. Forgive yourself for not living up to the "shoulds" and the "would if I coulds." Forgive life for being hard, and forgive God for making it that way. The best thing you can do for yourself is to stop focusing on what happened in the past, what you cannot do, and what is broken in your life. Banish from your mind the possibility of the impossible. As my Granny used to say, "'Can't' died in the cornfield." What matters after things go wrong is how you choose to react. Absorbing yourself in what is bad blinds you to what is good. Life is hard, but time marches on—and so should you. As a person with chronic health issues, I am frequently paralyzed by how my life has been affected by my health. I am frustrated all of the time. I am haunted by the ghost of who I used to be. Oftentimes, this overshadows who I am now, even when who I am now is good. I have lost my livelihood to chronic illness. I have even lost my mind—quite literally—a time or two. I have been beaten, raped, and abused. The only things that have gotten me through this are faith, hope, and love. Faith gives me the strength to trust and to forgive. Hope pushes me to react as positively as I can, and to focus on the good. And as the Bible verse says: "The greatest of these is love," and there is so much of it. Through everything I have endured, I overflow with love—love for my husband and children, love of life, and love for myself. In spite of everything that has happened, and that does happen, I go on. I let myself feel, in honesty, my emotions, and then I let them go. 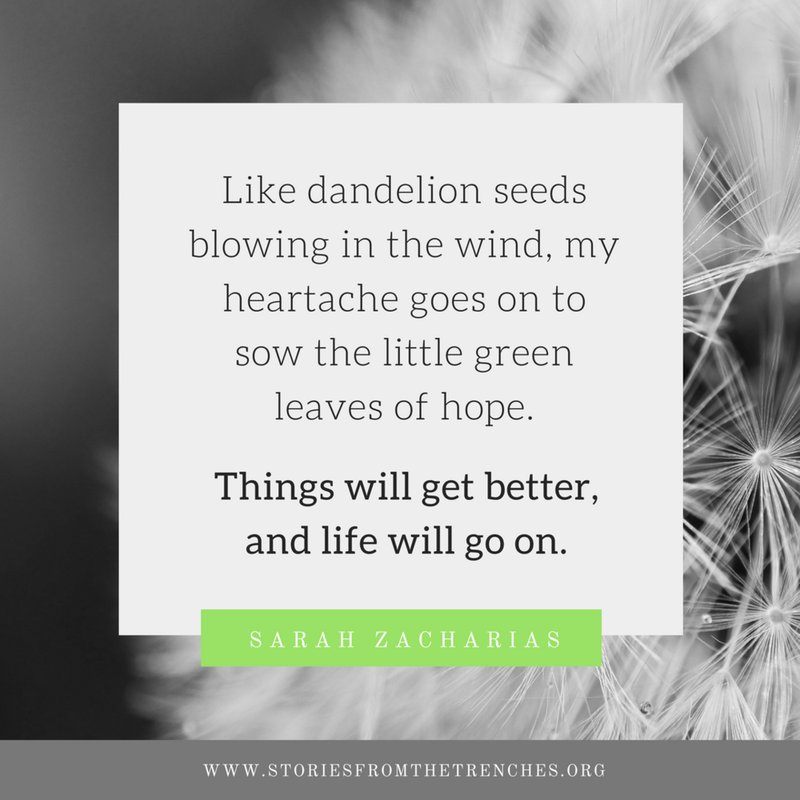 Like dandelion seeds blowing in the wind, my heartache goes on to sow the little green leaves of hope. Things will get better, and life will go on. No matter how hard you try to fight it, time is always slipping into the future. In order to seize that future and to make the best of it, one must always maintain the best attitude. Remind yourself of all the days that you thought you couldn't go on and how, in spite of it all, you did go on. You are a survivor. As to a weed that finds a way to grow between the cracks in the sidewalk, determination is also vitally important. Use the power of your mind to heal yourself. Sit and ponder all that is good. Find someone to hug. Immerse yourself in a child's laughter, the purr of a kitten, or the promise of a fresh start in an early morning sunrise. I get up, get out of bed, and dress myself each morning, no matter what. Some days you just have to fake it 'til you make it. As the artist, Pink, says, "You gotta get up and try, and try, and try . . . just because it burns, doesn't mean you're gonna die." The searing pain of today is not easily forgotten as yesterday's problem. Yet, suffering is all in the mind's eye. It is an illusion fed by your anger, your hurt, your disappointment. Let these things go. Make your heart light, and remember that hope is the only bee that makes honey without flowers. Please, love yourself. Please have faith that tomorrow the sun will climb into the sky, the oceans will rise and fall, and the moon will shine down with grace and a halo of stars. Time doesn't heal all wounds. Accepting that tomorrow can and will be better heals all wounds. It is true that this takes time. But—and this is important—it is your choice alone how much time you give away to hopelessness and despair. At any moment, you can choose to ease your suffering. All you have to do is allow it to happen. To do this, you must unchain yourself from the past and hitch a ride on the rising star of the future. P.S. I offer a special thank-you to my friend Jen, who taught me that even in the darkest of nights, morning is on the horizon. She stands tall, with golden crown.